Damo and Vikki's Round the World Trip! 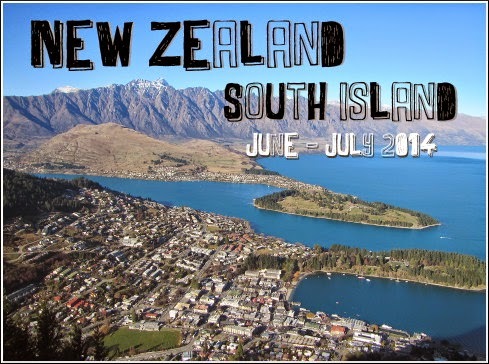 : New Zealand - South Island Highlights! 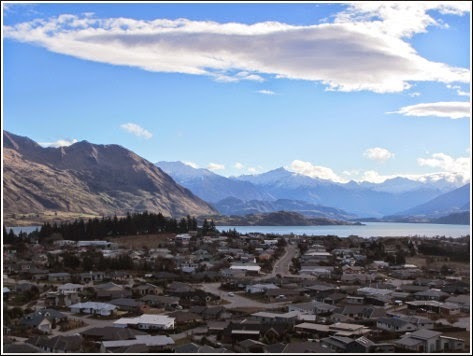 New Zealand - South Island Highlights! The ferry from Wellington took 3 hours and took us to a place called Picton. From there we drove for 2 hours to reach Kaikoura, where we had booked a hostel called Dusky Lodge and a whale watching trip for the following day! Kaikoura is known for it's whale watching and it's possible to see sperm whales year-round. The trip started with us watching a quick safety DVD and getting on a bus which took us to the boat. As soon as we left the marina me and Damo spotted a seal swimming by the boat, and it wasn’t much longer after that that we spotted our first whale! We could see the top of it floating in the water and spouting water out, it stayed there for about 10 minutes before diving down, which is when you see it’s tail! After watching the first whale we went further out to sea to see if we could find any more. 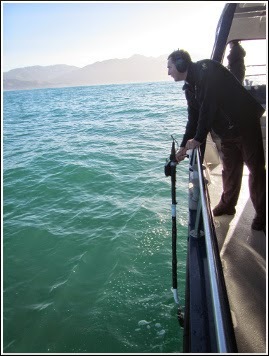 Every so often we would stop and the captain would put something called a hydrophone into the water, which enabled him to hear if there were any whales singing and if they were close! We soon found another whale and while we were watching that one, another one was spotted in the distance so we went over to that one too! After that we saw a few more seals swimming, some albatross, and as we got back towards the land, a couple of rocks which were also covered in seals! 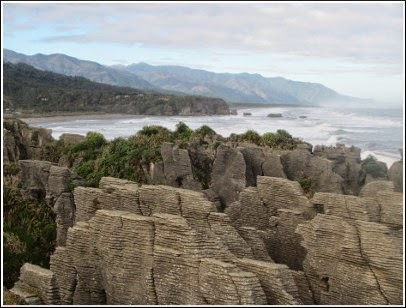 The next day we left Kaikoura and headed for the west coast to visit a place called Punakaiki, where there are “pancake rocks” and blow holes. The rocks were formed from the layering of limestone over millions of years, and they do look like pancakes stacked on top of each other! They are best seen at high tide, as this is when you get the blow hole effect of the water smashing through the rocks. We were only staying there for one night and high tide was at 6pm so we headed down there, although it was raining really heavily! We did a couple of videos of the water but headed back the following morning when the weather was a bit better to take some pictures. The rocks are free to see and the walkway takes about 15 minutes to walk all the way around. 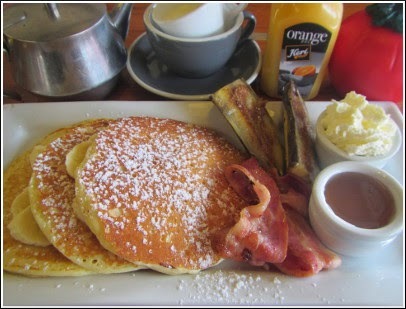 After looking at the rocks we went in the cafe opposite for some real pancakes! After that we drove down to Franz Josef, home of the Franz Josef Glacier, where we had booked into a hostel called Chateau Franz for 3 nights. We had booked into the cheapest type of double room they had, which turned out to be a converted caravan, which had a sign outside it saying the 'Love Shack!’ The guy that showed us to the room was expecting us to say we didn’t want to stay there I think, and said its only $10 more per night to stay in a nicer room, but we didn’t care so we said we’d stay. We then realised that night that it was freezing, and the windows didn’t close properly!! So the following day we moved to a much nicer room, and we didn’t get charged for it, result!! The day we arrived the guy in the hostel gave us a leaflet with a list of walks, so we went and did the Franz Josef glacier walk, basically a view of the glacier before we actually went up onto it the following day! After that we took the half hour drive to Lake Matheson, which is one of those lakes that you see in adverts for New Zealand and it always looks amazing. I was so excited to see it as the lake gives a mirror effect, but when we arrived the water wasn’t still and the tops of the mountains were covered in clouds so it didn’t have quite the same effect!!! The guy who gave us the leaflet had also told us to come and book our glacier trip through the hostel as he can do it $30 per person cheaper, so that’s what we went to do the following day. However when we got there it was a different guy and he said there was no discount for booking through them!! Grrr! He phoned up to book it for us anyway and we were the only people on the 11.40am trip so we needed another 2 people or it wouldn’t run! I was so annoyed because I could of just booked it online the day before! Anyway by the time we got down there we had 4 other people in our group so it was all good! We all got kitted out with waterproof trousers, socks, boots, gloves, jackets, bags and cramp-ons to wear over our boots on the ice. We walked across the road to where the helicopters were and the cloud had cleared and you could see the glacier perfectly! 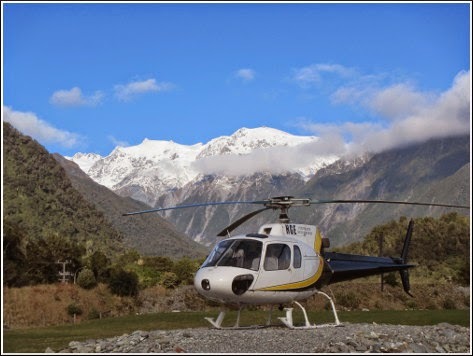 By helicopter is now the only way you can get onto Franz Josef glacier as it has retreated so much due to global warming. I got to sit in the front seat on the helicopter as I was the smallest (there’s advantages to being a short-arse sometimes!) We took off really quickly and it felt like being on a rollercoaster, it was a totally different feeling to when we went on the helicopter in Vegas! It only took about 10 minutes to arrive about halfway up the glacier. We got out of the helicopter and it felt so unreal like being on a different planet! You don’t realise how huge it is until you’re on it! We put our cramp-ons on and met our guide. Before putting them on I was slipping all over the ice like Bambi but as soon as they were on, walking on the ice was easy! Our guide lead us up through the ice, we saw an ice cave which we walked into and you could see through the hole at the top. We then carried on up, getting higher and higher! We then walked through a section of rock and ice mixed together. At some points there were ropes to help us climb, but it was all pretty easy. We then carried on down into a walkway where you had ice either side of you, which I found a little bit scary! We then went through another one which was even more scary and claustrophobic but I made myself do it because I didn’t want to be a wimp! Our guide then decided he was going to use his pick axe to make a new walkway, he said that each guide would hack away a bit more as they go through afterwards. There was no way I was going through that! Damo did but almost got stuck, haha! After that we started to make our way back down to where the helicopters pick us up from. We were on the ice for around 3 and a half hours in total! It was a totally amazing experience and nothing like anything else we’ve ever done! 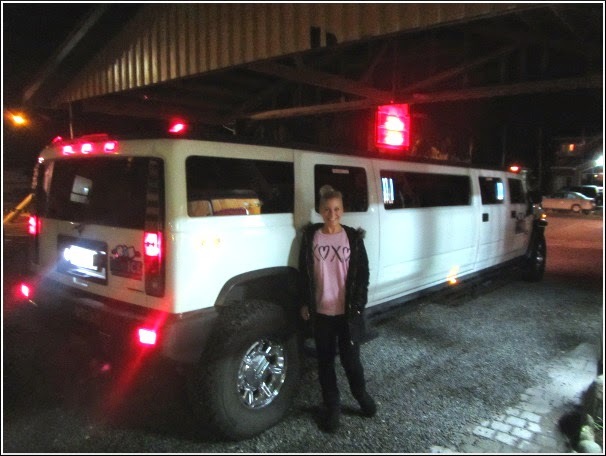 We did our trip with Franz Josef Glacier Guides and the trip we did was called the Ice Explorer. The next day we had planned on going to Fox Glacier to do a hike called Quick Fox but after yesterday being so good and rain forecast we decided not to bother. The day after that we were off to our next stop, Wanaka! It took about 3 and a half hours to get there. 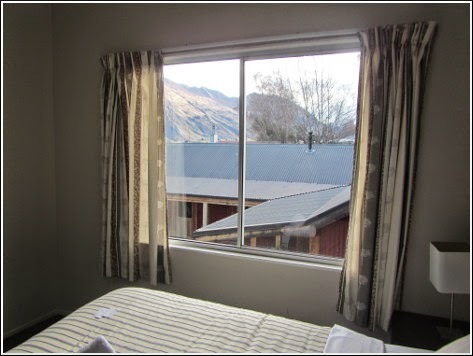 We stayed at an amazing hostel called Wanaka Backpaka! It was right on the lake with amazing views of the mountains, even from our room! 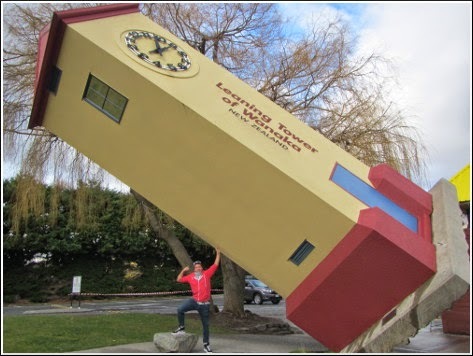 We spent 3 days in Wanaka, the first place we visited was Puzzling World. We already had heard about the place as my brother and his wife, Ian and Manda, had been there 10 years ago! It’s full of bizarre illusions and puzzles and mazes and was loads of fun! There were 5 different rooms to go in. The first one had a sloped floor which was at a 15 degree angle, it totally messes with your head and made us feel like we were going to fall over! We also managed to get photos of us doing a Michael Jackson style lean! Another room was full of faces that follow you, the next was where in one corner of the room you look really small and another you look really big! Even the toilets were cool! There was also a giant maze outside with 4 towers in each corner, and you had to find your way to each of them. After Puzzling World, the weather had brightened up so we walked up the nearby Mount Iron. The track was quite steep in some places but it was worth the climb as the view was great! 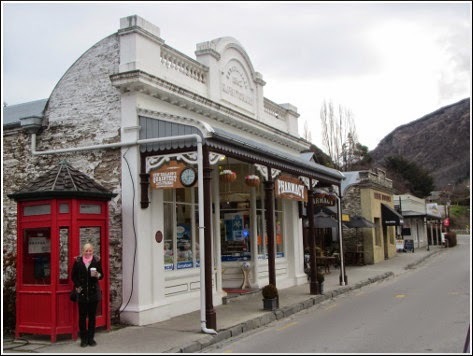 After Wanaka we headed to Arrowtown, which is not far from Queenstown. It is a historic gold mining town and we thought it would be a good base for a few days. It’s so cute and the main road was like a movie set! We stayed at the New Orleans Hotel which was above a nice pub, and had our own bathroom and a TV which was like luxury! 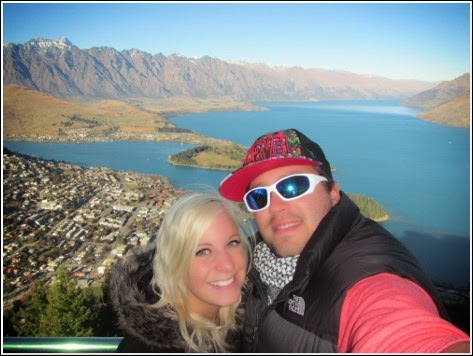 The first place we headed to was Skyline in Queenstown. We just wanted to do the gondola ride for the view, as we had done the luge at the Skyline in Rotorua, but they had a special price for the gondola, lunch and 3 luge rides so we did that! The lunch was a really nice buffet and we had a window seat to appreciate the amazing view! The next day we headed down to the Arrow River, just by our hotel, as it was used as a scene in Lord of the Rings. We took a few photos of that then had a look at the nearby Chinese Settlement, where Chinese gold miners came to live in the 1800’s. The houses they lived in were so tiny! 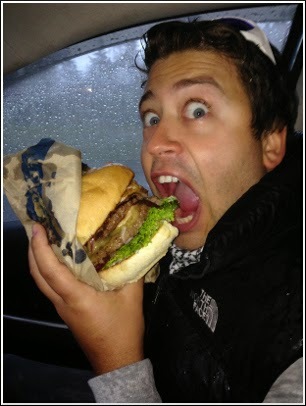 When we were in Fiji a girl we met called Sunny had told us about Fergburger in Queenstown and said we had to try it! So the next day when we were having a look round the town we spotted it, absolutely rammed with people and decided to give it a go! I went for a normal burger while Damo went for the "Big Al" which was the biggest one of them all and it was like Man vs Food, he even managed to eat it all! I can totally understand the hype though, they were so good!! 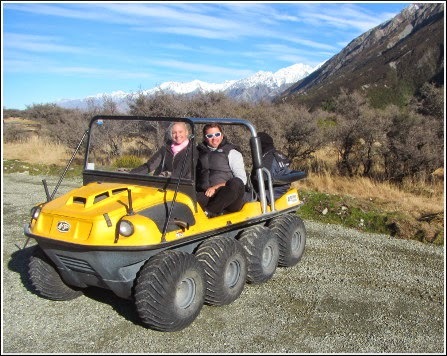 Another thing we did in Queenstown was the Shotover Jet, which we did instead of Milford Sound - we had booked a trip, but there is only one road in and out, and it was closed due to snow! I was a little bit gutted we missed seeing Milford Sound but overall we did so much in New Zealand that we can’t really complain! The Shotover Jet is a jet-boat ride on the Shotover river which was loads of fun, they speed along inches away from the rocks and do lots of 360 spins! 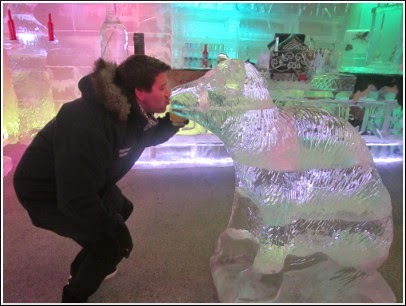 That night we went to the cinema then went to go to the Minus 5 ice bar as we had some free tickets we’d got when we bought some energy drinks! When we arrived though they were just closing as it was so quiet. There was another Ice Bar we’d seen called Below Zero so we thought we’d go there instead, and when we got there the guy even said he’d honour our free tickets for the other place if we had a drink each! We went in and there were two guys in there playing on an air hockey table that was made of ice. Suddenly there was a loud crash and the air hockey table was smashed into a million pieces and the 2 guys were on top of it!!! We managed about half an hour in there before I was freezing and had to get out of there! After Queenstown our next destination was Dunedin! As we drove out of Queenstown we saw our first snow for the whole time we’d been in New Zealand! In Dunedin we stayed at a hostel called Kiwi’s Nest and it was owned by the loveliest couple who were so friendly and helpful with things to do in the area! One of the first places we visited was Cadbury World! We did the full tour and our tour guide was a man from Derbyshire with a really strong accent, even though he had been in New Zealand for something like 30 years! First we watched a short video then had to put hair nets on!! We got lead around the factory, learnt how chocolate is made, and got given loads of free chocolate! That afternoon we drove to Baldwin Street, which is the steepest street in the world! We parked at the bottom and walked up to the top, which wasn’t as hard as we thought. We then ran back down and I felt like I wouldn’t be able to stop! We got back in the car and drove to Signal Hill lookout, which was a great view over the city. After that we decided to go and see something else so we went to Larnach Castle, which is New Zealand’s only castle. We thought we would just go and look at it but you have to pay just to go into the grounds! And we thought it was the biggest load of rubbish ever! If you’ve ever been to any kind of castle in England then don’t bother going here. I don’t know how they can class it as a castle, it’s just a big house! But the gardens were pretty and there were some cute ducks! The following day we did a trip with Elm Wildlife Tours, which we had found out about through a leaflet in the hostel. 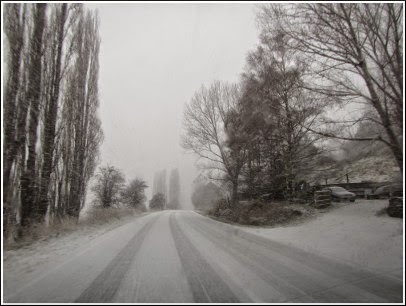 We were picked up at 1pm and driven to the Otago Peninsular. The first part was a little bit boring, as the other couple on the trip had paid extra to see baby albatross birds so while they did that we were stood looking at birds on the edge of the cliff. After that we drove further down the road and onto some private land, where we parked up on a hill in the middle of a field of sheep! We walked down towards the beach, and could already see that the beach was full of a big group of sea lions just chilling on the sand! 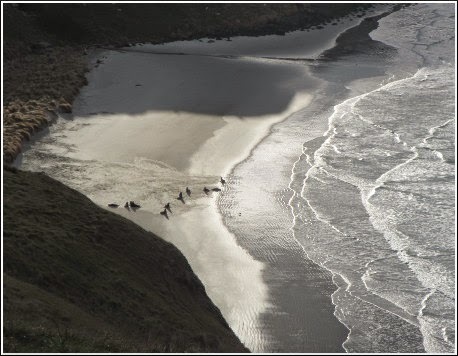 As we made our way down to the beach we walked through an area which had been made to encourage penguins to nest there. We didn’t see any around but as soon as we got onto the beach there was one just coming out of the sea! 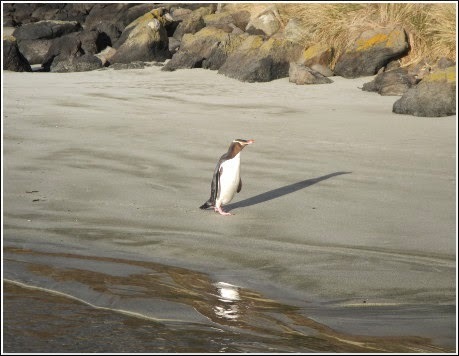 It was so cool to see a penguin just waddling along towards us! The guide told us that they have got used to humans now so they have no problem walking past whereas they used to run away! After this we made our way across the beach walking through where all the sea lions were laying without getting too close! He told us that this was the most females he had ever seen on the beach, there were 9 in total. We spent a while just watching them as a few of them were really active, then we watched some more penguins at the other end of the beach. After watching the penguins we started to make our way back across the beach. One of the sea lions looked like he was going to chase us so the guide took us up through the dunes instead! There were a few sea lions laying in the dunes too, including a pregnant one. 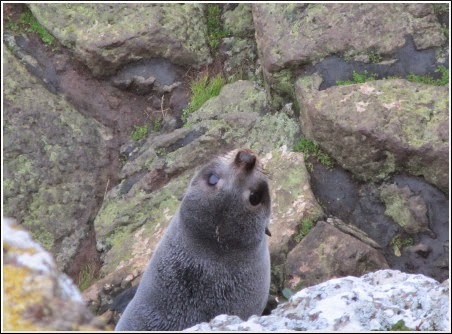 After making our way back up to the van, we headed down the other side of the hill, where there were lots of fur seals on the rocks. We sat in a viewing area, which allowed us to be really close without disturbing them. There were some cute little pups and some playing in the rock pools! This tour was one of my favourite things we did in New Zealand, it was amazing to see penguins, sea lions and seals all in the wild. After leaving Dunedin, we drove up the coast a little way to visit the Moeraki Boulders. They are a group of boulders on a stretch of beach which are sphere shaped, and really unique! We had a few more days left before we flew from Christchurch to Sydney on the 11th July, as we had allowed more time for the South Island in case we got caught in any snow. 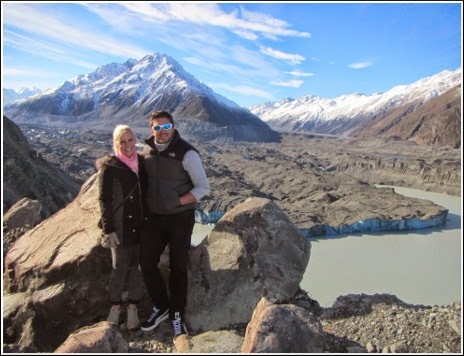 We knew a couple of days would be enough in Christchurch so with the extra few days we headed for Mount Cook. The drive to get there was beautiful, everywhere in New Zealand is, but this was even more beautiful!! We kept stopping on the way to take photos! We had booked an Argo tour online, which is an 8 wheel drive vehicle, and it took us up to the Tasman glacier, right by Mount Cook. It was a really bumpy ride! We stopped a few times to take photos, and the best view was when we got to the top and walked up to the view of the glacier! 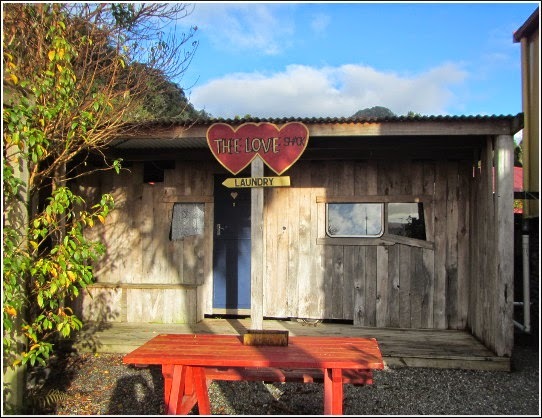 I was so glad we chose to go here, we hadn't even planned to do it and it was one of my favourite places we saw in New Zealand! That night we stayed in Lake Tekapo, which was around an hour from Mount Cook and in the direction of our final destination, Christchurch. 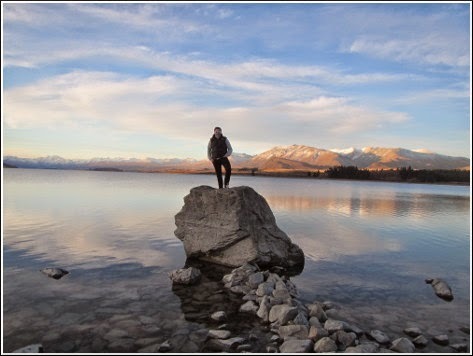 After checking into a hostel (Tailor-Made-Tekapo) we went down to the lake where we skimmed stones, saw people getting married and took pictures of a sheepdog statue for my mum! We spent our last couple of days in Christchurch, it was so sad to see the devastation that the earthquake of 2011 has done. While we were there we went in an earthquake museum and it was so interesting, there was also a video of people talking about the day it happened. We saw the cathedral, which has been left, as the people of the town can’t decide whether to rebuild it or knock it down and start again! We also visited the ‘Cardboard Cathedral’ which was a gift from a Japanese architect as a temporary replacement. If you've not already seen it on the North Island page, here is a video I made of our time in New Zealand, featuring all the things you've just read about! New Zealand - North Island Highlights!